The candidate can register with the Mail ID & Password. The candidate can attach the photocopy of necessary documents. The candidate can pay the application fee of INR 1000(INR 500 for SC/ ST category) through DD. The admission process is Merit-based on Previous Qualifying Examination. The counseling process will be held for the selection process as per the guidelines of the Annamalai University, Cuddalore. The candidate can carry the original documents and Counseling fees at the time of counseling. In order to get admission in Annamalai University, Cuddalore the candidate should have passed Graduation/ BBA with 50% marks. The candidate should have passed 10+2 examination with 50% marks to apply for Annamalai University, Cuddalore admissions 2019. The candidate should have passed Diploma with the relevant subject to apply for Annamalai University, Cuddalore admissions 2019. The candidate should have passed Diploma in Pharmacy to apply for Annamalai University, Cuddalore admissions 2019. The candidate should have passed 10+2 examination with PCB/ PCM/ PCBE with 50% marks to apply for Annamalai University, Cuddalore admissions 2019. The candidate should have passed 10+2 examination with PCM/ Computer Science with 50% marks to apply for Annamalai University, Cuddalore admissions 2019. The candidate should have passed 10+2 examination to apply for Annamalai University, Cuddalore admissions 2019. The candidate should have passed the 10th examination with 35% marks to apply for Annamalai University, Cuddalore admissions 2019. In order to get admission in Annamalai University, Cuddalore the candidate should have passed Bachelor's Degree in the related subject. In order to get admission in Annamalai University, Cuddalore the candidate should have passed BA/ B.Sc in English as a compulsory subject from recognized University. In order to get admission in Annamalai University, Cuddalore the candidate should have passed BCA with 50% marks. The candidate should have passed the B.Com/ BBA/ BA from a recognized University to apply for Annamalai University, Cuddalore admissions 2019. The candidate should have passed BFA from a recognized University to apply for Annamalai University, Cuddalore admissions 2019. In order to get admission in Annamalai University, Cuddalore the candidate should have passed B.Lib.I.Sc from a recognized University. The candidate should have passed B.P.Ed from a recognized University to apply for Annamalai University, Cuddalore admissions 2019. In order to get admission in Annamalai University, Cuddalore the candidate should have passed B.Pharm with 50% marks. In order to get admission in Annamalai University, Cuddalore the candidate should have passed Master Degree in the relevant area. The candidate should have passed B.Sc in relevant stream with 50% marks to apply for Annamalai University, Cuddalore admissions 2019. The candidate should have passed 10+2/ B.Sc with Physics, Chemistry, Biology/ Mathematics to apply for Annamalai University, Cuddalore admissions 2019. In order to get admission in Annamalai University, Cuddalore the candidate should have passed 10+2 examination in any stream with 50% marks. The candidate should have passed BE/ B.Tech in Civil Engineering/ Civil and Structural Engineering/ Environmental Engineering/ Mechanical Engineering/ Industrial Engineering/ Chemical Engineering/ Biochemical Engineering/ Biotechnology/ Industrial Biotechnology/ Chemical and Environmental Engineering to apply for Annamalai University, Cuddalore admissions 2019. The candidate should have passed BE/ B.Tech in Civil Engineering / Civil and Structural Engineering/ Environmental Engineering/ Agricultural and Irrigation Engineering/ Geo-Informatics / Mechanical Engineering/ B.Tech. Energy and Environmental Engineering Graduates to apply for Annamalai University, Cuddalore admissions 2019. The candidate should have passed BE/ B.Tech in Civil Engineering / Civil and Structural Engineering Graduates to apply for Annamalai University, Cuddalore admissions 2019. The candidate should have passed BE/ B.Tech in Mechanical/ Manufacturing/ Automobile/ Chemical Engineering Graduates to apply for Annamalai University, Cuddalore admissions 2019.
aeronautical / Marine Materials Science Engineering Graduates to apply for Annamalai University, Cuddalore admissions 2019. The candidate should have passed BE/ B.Tech in Electrical and Electronics Engineering to apply for Annamalai University, Cuddalore admissions 2019. In order to get admission in Annamalai University, Cuddalore, the candidate should have passed BE/ B.Tech in Electrical and Electronics Engineering/ Control and Instrumentation Engineering/ Electronics and Instrumentation Engineering/ Information Technology / Electronics and Communication Engineering/ Computer Science and Engineering. In order to get admission in Annamalai University, Cuddalore, the candidate should have passed BE/ B.Tech in Chemical Engineering/ Petroleum Engineering/ Petrochemical Technology. The candidate should have passed BE/ B.Tech in Computer Science and Engineering/ Software Engineering/ Electronics and Communication Engineering/ Information Technology to apply for Annamalai University, Cuddalore admissions 2019. In order to get admission in Annamalai University, Cuddalore, the candidate should have passed BE/ B.Tech in Information Technology/ Computer Science and Engineering/ Software Engineering/ Electronics and Communication Engineering. During my time of admission, it's was a direct admission with no entrance thereafter, the system changed, the entrance examination is compulsion, most preferred state students, others state students are hard to get admission now. Again the system change to counselling those who completed 12 board exams can apply for this college. The cutoffs are too High as many good students come for admission. 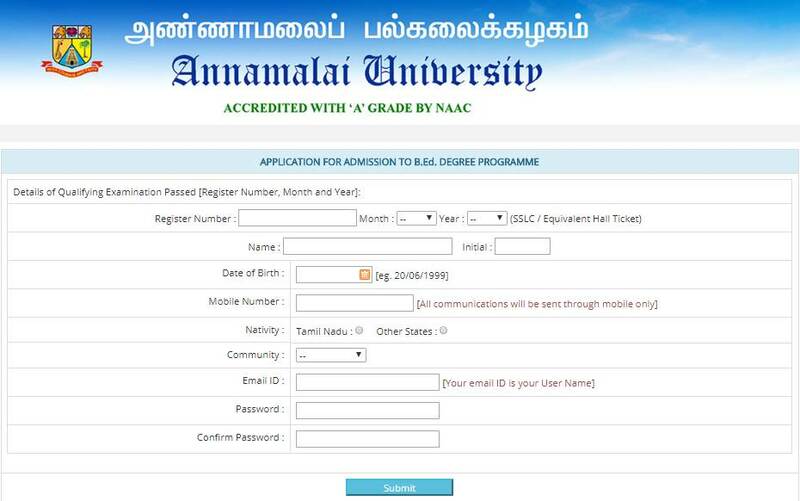 The eligibility criteria to join Annamalai University was that the applicant should be a graduate. There was no entrance examination. I applied for the form online then after filling the application was sent to the university along with required documents. After two months the selection list was published and I was intimated to admission via a phone call. The typical cutoff was about 55% for instate students and 70% for outstate. One must have a minimum completed his/her H.S from a recognized board with PCM (physic, chemistry & Mathematics) with a minimum of 60% in aggregate is the eligibility criteria. AIEE entrance examination (a good score might help in the admission procedure). 60% including PCM is the cut-off. 12th class or equivalent under recognized university. There was no entrance examination for my course. There was no particular cutoffs. It was distance education program (correspondence) so a passed certificate was the requirement. Candidates are given admission into Annamalai University, [AU] Cuddalore according to the marks obtained in the qualifying examination along with the entrance test score. Here the admission is truly based on your +2 marks.If you have got more than 70% then you can get admission easily. Candidate must have passed the 12th from a recognized institute to get admission in this college. No separate entrance exam is conducted. Minimum 196 cutoff mark is required. The eligibility criteria for my course is to complete 12th standard and should be passed. No entrance exam is needed. Admission will be based on aggregate marks. The admission is merit based on previous qualifying examination. There is no entrance examination. The typical cutoff of my course is 45%. The candidate must have passed the 12th from a recognized institute. No entrance exam is conducted. Minimum 120 cutoff mark is required. Through merit-based marks and open counselling. No entrance exams were conducted. Cutoffs for my category was 195. Admissions are based on merit system. No entrance exam will be required. Cut off will be based on the castes. The eligible criteria for applying MA admission was above 50% marks in academic records. No entrance exam was taken for the admission. Annamalai University, Cuddalore is affiliated to University Grants Commission and has also received an 'A' grade from National Assessment and Accreditation Council in 2014. How can I apply for this university? Applicants seeking admission can register themselves for the above-mentioned courses through the online application process. Applicants seeking admission should log on to the official university website and fill the concerned application form to register for the above-mentioned PG programs. Upon filling in all the relevant details, applicants seeking admission will be allotted an online application number for future correspondence. The Directorate of Distance Education established in 1979 offers four hundred and one different programs of study under the distance education mode. It is credited with the largest enrollment in India and is well equipped with a computer and other infrastructure, adequate teaching faculty and administrative set-up of its own, study centers, computer training centers, etc., to serve its students' clientele in their best interest at their door steps. It has also the unique distinction of offering first in India, Postgraduate Degree Programs in Applied Psychology, Physics, Chemistry, Zoology, Botany, Bioinformatics, and Law through Distance Education mode. Campus Recruitment Programs - Campus Recruitment Programs (since Sep 2004) is one of the major events in which prestigious organizations like Asian Motors Ltd, Standard Chartered Bank, Apollo Pharmaceuticals, ESSAR Steel etc. participate to recruit talented candidates.